In recent years, national and state school administrator associations have stepped up to help their members, especially superintendents, understand and expand the role of technology in their districts’ operations, including business as well as teaching and learning. The Sioux Falls School District in South Dakota created its Career & Technical Education Academy to give vocational high school students industryrelevant education. T&L editors follow the stakeholders at Village Charter School in Trenton as they implement Pearson’s SuccessMaker software on a 40-seat Dell PC desktop network. 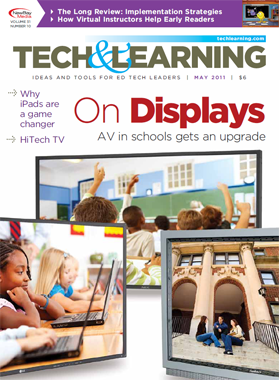 Ellen Ullman compares two schools: one using a display screen, the other a projector. The schools share the pros and cons of each technology. How About Create and Consume? Sascha Zuger asks how tech is improving students’ reading skills. The iPad is generating more discussion about the role of technology in learning than any tool or event to date.